A bit of a mixed bag for you today so bring a compass while we wander aimlessly over a bunch of Magic: the Gathering related news. With the rise in populatiry of Esper Control in the Top 8 positions of Pro Tour Dragons of Tarkir, we fully expect to start seeing these at our local gaming store, OMG! Games here in Barrie. 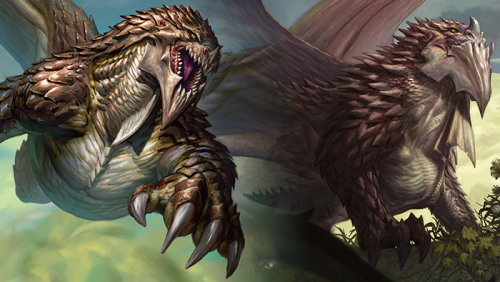 Specifically, look for a rise in control decks with finishers such as Dragonlord Ojutai and / or Silumgar, the Drifting Death along with a singleton of Ugin, the Spirit Dragon. More regional tournaments are certainly evolving this way too but we still see a decent variety of decklists making top marks like Bant Heroic, Jeskai Tokens, Abzan Aggro and others. 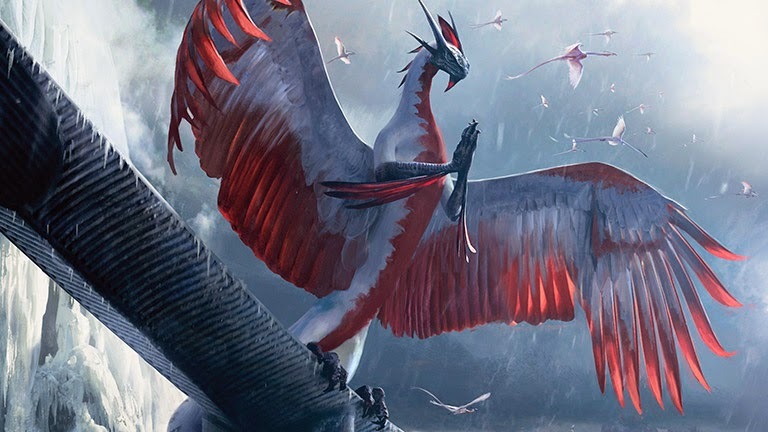 We think that players will be quick to react and evolve to this change with tweaked or new lists such as Sam Black's Red / Green Bees (featuring Hornet's nest) or perhaps going all out mono-red like Raphael Levy's Mono-Red Devotion with fliers such as Ashchloud & Flamewake Phoenix and Thunderbreak Regent. 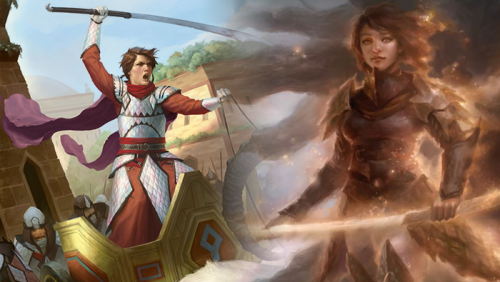 Earlier this week, Marijn Lybaert with Tournamentcenter.eu, (the organizer of Grand Prix Utrecht 2015) previewed two more Modern Masters 2015 cards - Splinter Twin and Spellskite, both rather popular in modern format. 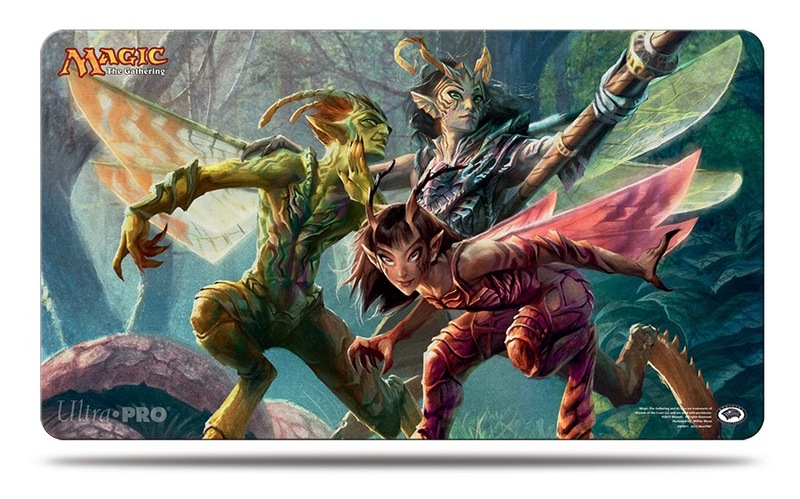 While we are yattering about GP Utrecht, here is the very cool playmat by Rob Alexander which is to be part of the organiser's VIP package and prize wall. 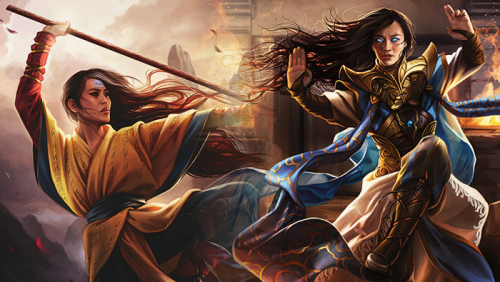 Some news about some of the controvesy you may have heard from the Pro Tour Dragon's of Tarkir tournaments. Quite specifically, an update on the investigation into possible cheating which was posted to the mothersite yesterday. Filipe Valdivia has been suspended from playing in sanctioned Magic tournaments for six months following his investigation. Felipe Valdiva took a scryland back to his hand and replayed it to scry before using Narset's +1 ability. 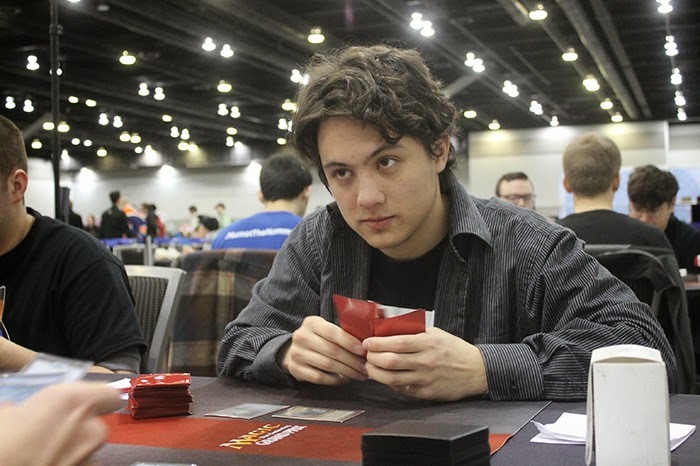 Stephen Speck has been suspended from playing in sanctioned Magic tournaments for 36 months following his investigation. Stephen Speck disqualified for presenting a 53 card deck to his opponent with a 7 card hand off to the side. Patrick Chapin was given a game loss and we won't get into that at all as we don't completely agree with the judge's call on it and yet at the same time can clearly see the other side of the argument. Also Jeremy Dezani disqualified for misrepresenting the game state to the judge. Jeremy had some previous history which could be considered questionable. In this case the incident occurred in Round 8 when judges were called to his table by the players in the match and involved a missed trigger on an Eidolon we think. After an investigation, it became clear that Dezani had modified his version of the story while discussing the incident with judges. Hope all have had a great weekend. This weekend for us was spent on a few epic games of Settlers of Catan, not to be confused with the popular Settlers of Brooklyn. 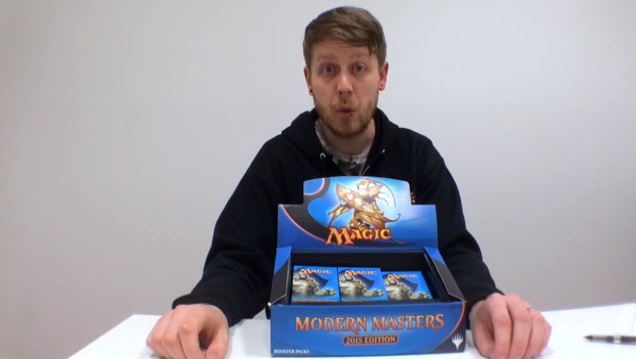 Anywhoos, we should probably get to some Magic: teh Gathering content - specifically Modern Masters 2015 edition, which is due to be released at the end of next month. 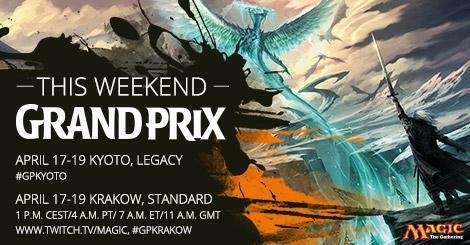 WotC has planned the Grand Prix weekend in Las Vegas, Utrecht, and Chiba to be the pivotal event for the release of Modern Masters 2015 and encourages gamers to use the hashtag #‎MakeMagicHistory to share stories 'n' pics. As we won't be able to attend either weekend, we hope local gaming stores #‎MakeMagicHistory by keeping the price for Modern Masters to under 300% of the MRSP. 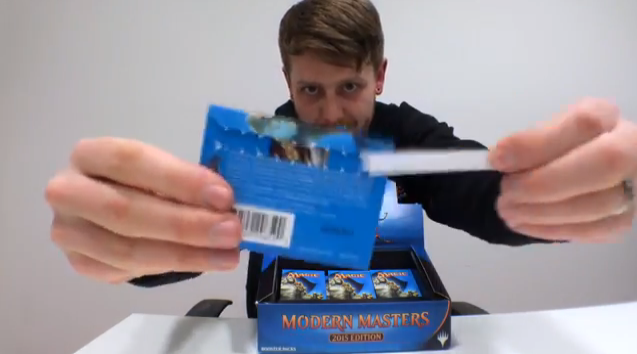 Not much else in the way of previews, but loads of tantalizing images, like Magic's European community manager, Dan Barrett who just needs to let us see inside that environmentally considerate MM2015 package he just cracked in this YouTube vid. Again, these are rumours but since the poster proved true last time (with the previous Modern Masters spoilers), we will provide a benefit of doubt. We'd be happy too were it not for another blast of winter and a solid accumulation of snow (that's frozen water if you've not seen that stuff before). We still are of good cheer as we will be off to Friday Night Magic later this evening at our local games shop, OMG! Games here in Barrie to get some standard format Magic: the Gathering in. Although the store is in a plaza nearby Georgian College, one would think that the lion's share of attendees would be coming from the College, but in fact, there has been an increasing number coming in from nearby Canadian Forces Base Borden in Angus, not quite a half-hour away. 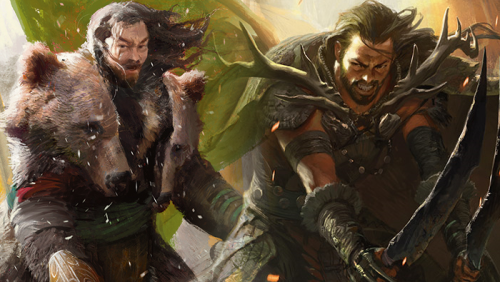 Anywhoos, enough of us whinning about the ever-lasting winter and delayed spring, let's get into some MTG news. In yesterday's Arcana post by Blake Rasmussen, he provided updates as to upcoming Friday Night Magic promos and DANG! 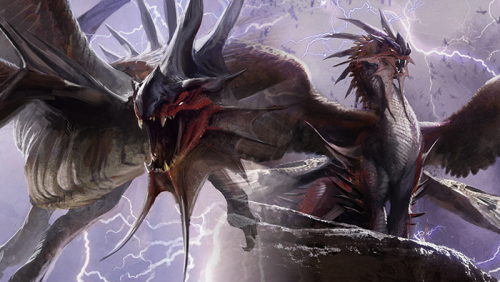 we gotta say we are pretty impressed with July's upcoming FNM promo - 'Path to Exile'. Typically for the last year or so, most of the FNM promos (perhaps all?) have all been cards currently in standard which we feel is a good thingy, but colour us impressed with this older card, although not legal for standard, it is a "near-universal staple in Modern" and very popular in many other formats. When we were playing at the time when Conflux was released in February 2009, we were sure to pick up all the Paths we could. This was for almost the next two years before it rotated out of standard, the 'go to' spot removal. We recall some players splashed white just for this. What made this card rather handy is that one could Path to Exile on your own creature to serve as a passable mana-fixer were you in a crunch. PtE also ignited a good deal of debate as to which was better - Path to Exile OR Swords to Plowshares. 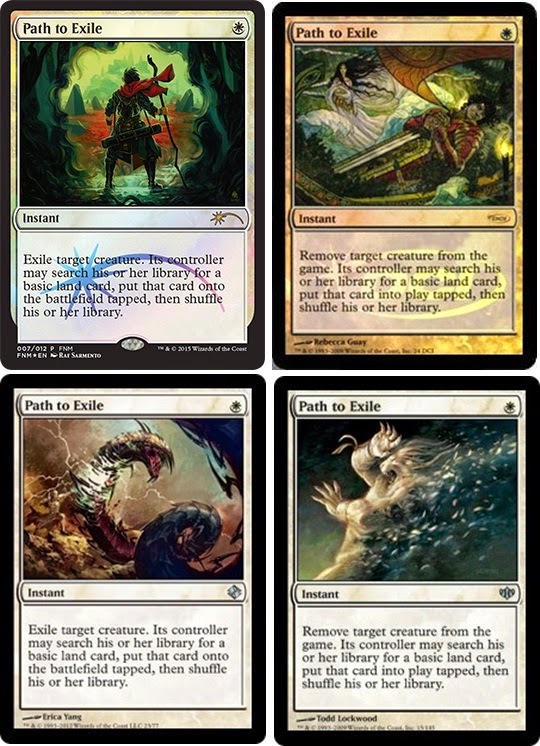 With Path, the downside was giving your opponent an extra land where Swords provided the controller of the exiled creature life gain equal to the exiled creature's power. We never really did take any sides of this argument as the game state situation dictated which card proved better. So popular is Path to Exile, WotC printed this in Modern Event Deck, Modern Masters, Duel Decks, Commander, Archenemy, and originally in Conflux (Shards of Alara block). Anywhoos, we do not want to divagate from today's news on the July's FNM promo - check out the incredibly sweet card art by Raf Sarment ! Good Luck at FNM tonight gamers ! 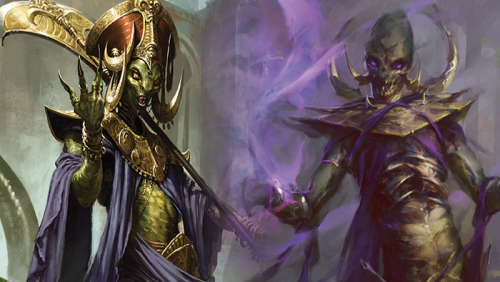 Some delicious Magic: the Gathering spoiler news out today - another Modern Masters 2 spoiler. 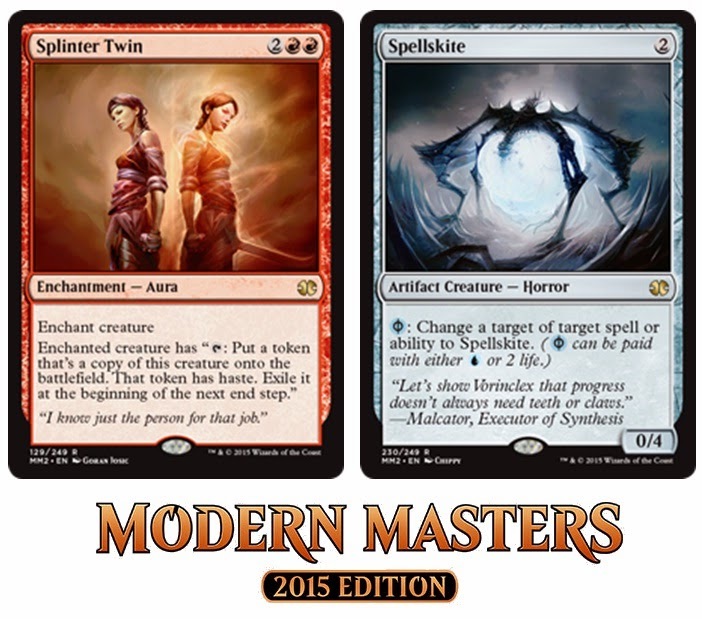 Modern Masters 2015 Edition, to be released 22nd May will revisit some of the most notable planes from recent history, including Alara, Kamigawa, Lorwyn, Mirrodin, Ravnica, and Zendikar. Each pack is to have 15 random cards including one (foil) premium as will retail for about 10 clams. This is certainly is expected to get Modern constructed format players excited but is certainly designed to be drafted. 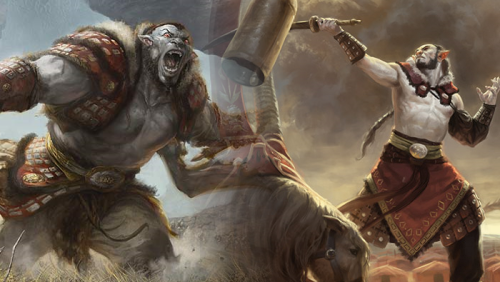 Anywhoos, on to today's Magic: the Gathering - Modern Masters 2 Spoiler ! 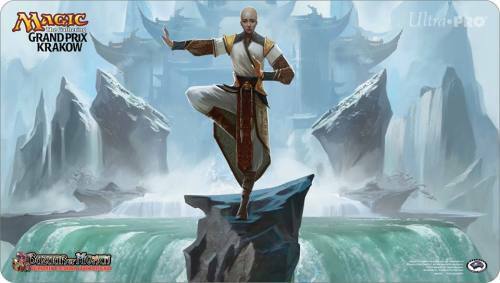 Over on Channel Fireball, LSV dropped the next Modern Masters 2 preview along with the Grand Prix Vegas (May 28-31, 2015) side-event Playmat, also featuring the new art being provided to the Clique. 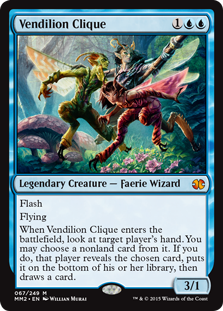 Vendilion Clique joins four other cards so far previewed - Etched Champion, Emarakul, Karn Liberated and Tarmogoyf. Today it is raining cats 'n' dawgs and other things here in Barrie, Ontario and the last stubborn remnants of snow are sure to be purged by day's end. Chances are that we won't be needing the dog sled to get to our local gaming store, OMG! Games from now on in as things are starting to green up and shy foliage are just now starting to appear. Looks very decent to take full advantage of any devotion to green strategies so far. Avatar and Swordwise is value at double green and decent 3/2 bodies with the Av receiving conditional eotb counters. Rev Hunter is the first devotion card here and expected to benefit greatly. The Satyr is an obvious choice, adding another two to devotion tech and is decent both early and late game. Dragons of Tarkir new Surrak also adds another double green and is saddled with the new formidable mechanic allowing a conditional haste to a creature. Alhtough Surrak is legendary, a full book-set of four may be acceptable considering this will have a large target on it for removal. We can imagine that this may occasionally be a dead card in your hand but perhaps not often. 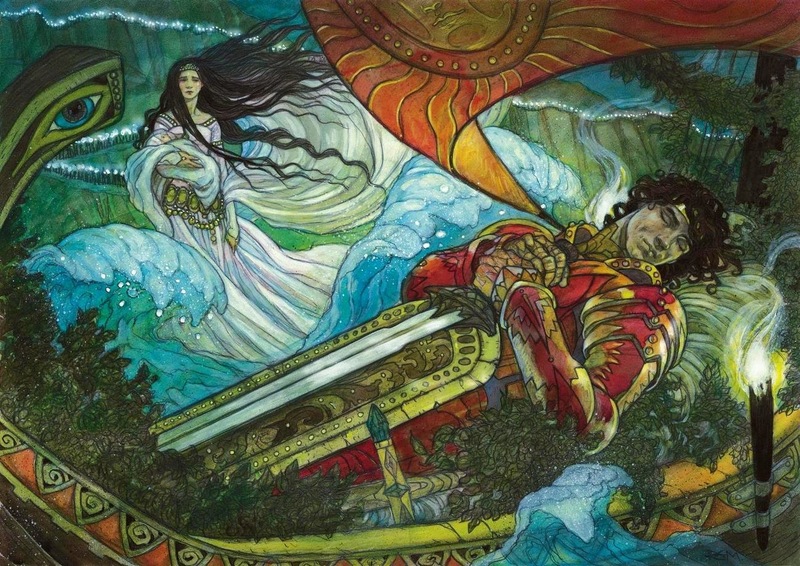 We are not altogether certain of Saito's choice of a deckset of Cached Defenses - perhaps this is intended to apply to Bassara or Avatar in order to fend off flying dragons. Nylea, God of the Hunt looks good in the list. We would love to take this for a spin and really only need to complete our decksets of Avatar and Surrak to get if off the ground. 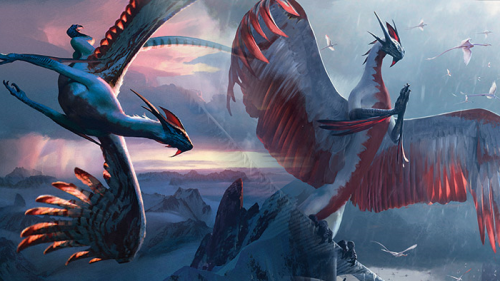 Our congratulations go out to fellow Canadian Alexander Hayne on his successful win at Grand Prix Kraków over the weekend with his Esper (white / blue / black) Dragons decklist. 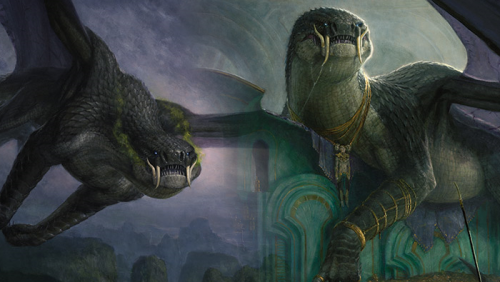 Five of the Top 8 lists were in fact Esper Dragons (Control) which featured Ugin, the Spirit Dragon, Silumgar, the Drifting Death and Dragonlord Ajutai. 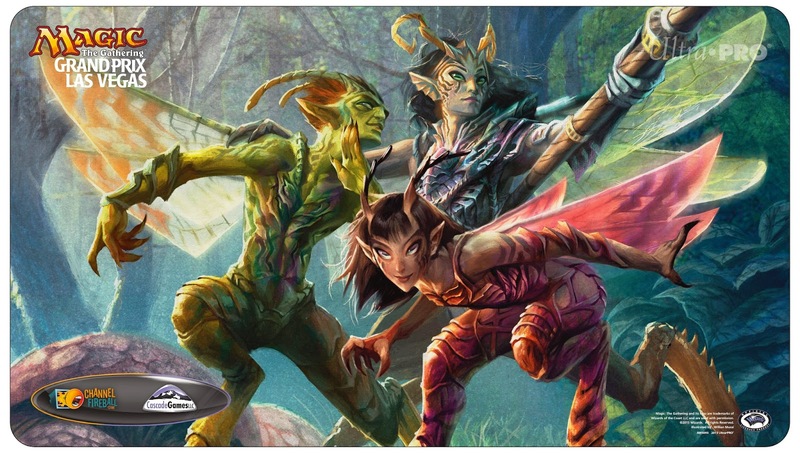 In other news, specifically financial news, Hasbro the parent company of Wizards of the Coast provided a rather decent / optimistic First Quarter Report. Games category revenues increased 7% in the quarter. Franchise Brands MAGIC: THE GATHERING and MONOPOLY increased revenues in the quarter and contributed to successful overall revenue of the company. As we had mentioned in yesterday's post, we've been spending a bit of time brewing up standard decklists and have 4 so far and a mountain of Magic: the Gathering cards to clean-up, sort, and organise after this is all done. Anywhoos, one of the new lists we are rather pleased with is a standard format Goblins (or 'gobbies', as we like to call 'em). This build is essentially a mon-Red token strategy which can be considered a slight variation of Sligh. 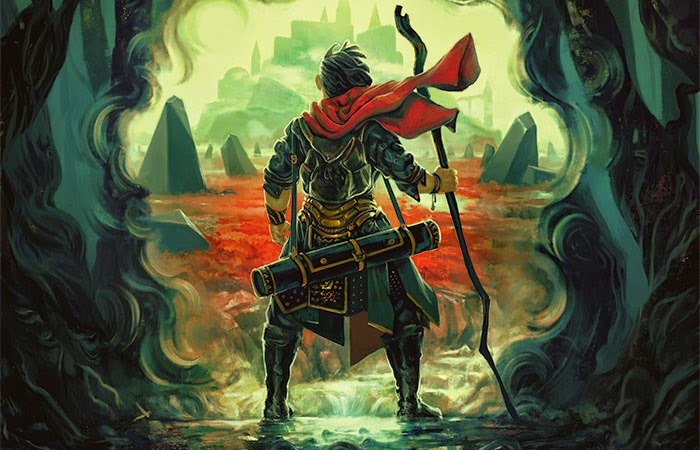 If you may be unaware, Sligh decks (named after Paul Sligh) are generally red-based aggressive decks that use small and cheap creatures on early turns to quickly diminish the opponent's life total. If the creatures are not enough, burn spells are used to finish the opponent off. The burn spells also double to remove blockers. As you may know, here at MTG Realm, we've got a thingy for token decks and we want to take yet another run at it using Purphorus, God of the Forge and Obelisk of Urd. Simply, Purphorus will ding your opponent for 2 life every time you drop a critter while Obelisk can be dropped early for its convoke cost. These two cards represent Plan A and Plan B which we will give equal weight to. Rather obvious we need to power the engine with cheap creatures, so we will use Dragon Fodder, Hordeling Outburst, as well as Goblin Rabblemaster to help get out 1/1 red Goblin creature tokens. • 4x Frenzied Goblin - nice one-drop which gives the opportunity for a small measure of control over how the opponent blocks. • 4x Foundry Street Denizen - solid one-drop which will typically be packing a bigger punch with all the creatures we are dropping. • Mardu Scout - 3/1 for 2 ain't bad and we like that we can dash this out should we suspect sorcery removal. • 3x Goblin Rabblemaster (one's a promo) and we only have three of 'em. Good token generation and this guy can get huge himself. • 4x Hordeling Outburst - 3 drop for 3 dudes. • 3x Purphoros, God of the Forge - we don't ever expect him to go nuclear and are quite happy with how this pings. • 3x Obelisk of Urd - Urd is the word y'awl. Nice +2/+2 pump - just be sure to name 'goblin' as your creature type. • 2 Arc Lightning - our metagame has a lot of small dudes. • 1x Hammer of Purphoros - haste is nice. Our casual games at the kitchen table shows that this has promise and we will likely bring it to our local gaming store, OMG! Games here in Barrie after we feel a bit more confident with it. 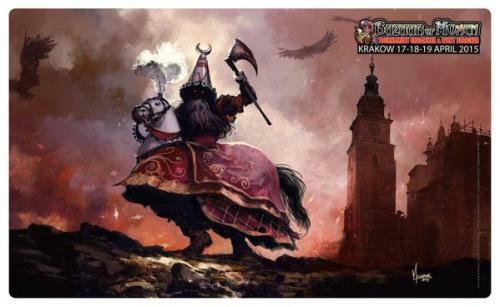 Some awesome standard format gaming today in Kraków, Poland. 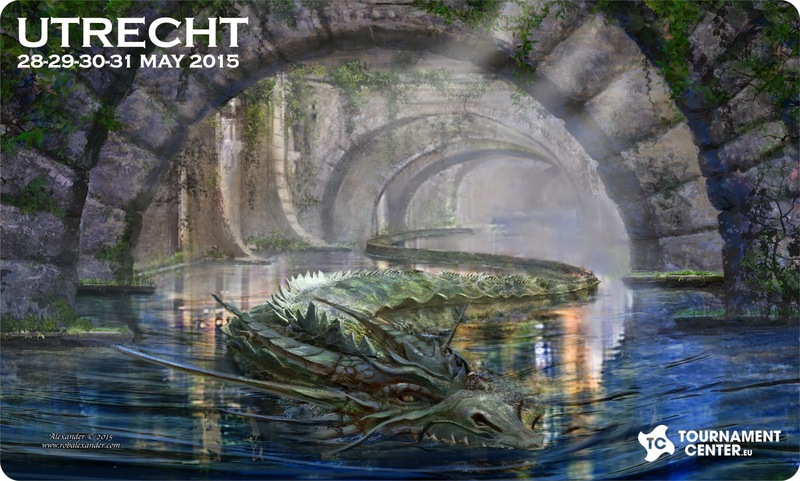 The Playmat for this event is the very aesthetic Sight Beyond Sight, illustrated by Anastasia Ovchinnikova. The Tower is the only remaining part of the old Kraków Town Hall (Ratusz, see painting, below) demolished in 1820 as part of the city plan to open up the Main Square. Its cellars once housed a city prison with a Medieval torture chamber. This dates to the Renaissance and is one of the city’s most recognizable icons. It is the central feature of the main market square in the Kraków Old Town. It was once a major centre of international trade. Traveling merchants met there to discuss business and to barter. During its golden age in the 15th century, the hall was the source of a variety of exotic imports from the east – spices, silk, leather and wax – while Kraków itself exported textiles, lead, and salt from the Wieliczka Salt Mine. As the peaceful merchants of Lorwyn, the merrows travel the rivers trading goods or using magic to help travelers across dangerous rapids. However, during the dark Shadowmoor periods, the merrows become bloodthirsty cut-throats, eager to pillage from any settlements near the water’s edge. Lorwyn is an idyllic, storybook world where races of fable thrive in perpetual midsummer. The plane is covered with dense forests, meandering rivers, and gently rolling meadows. The sun never quite dips below the horizon, and winter is entirely unknown. Lorwyn is also notable for its lack of humans. The plane is dominated by its elves, who consider themselves arbiters and enforcers of natural beauty. 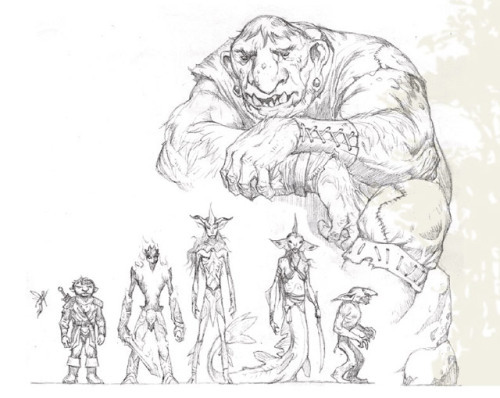 The indigenous wildlife of Lorwyn is dominated by eight sentient races: elves, kithkin, merrows, flamekin, boggarts, treefolk, giants, and faeries. 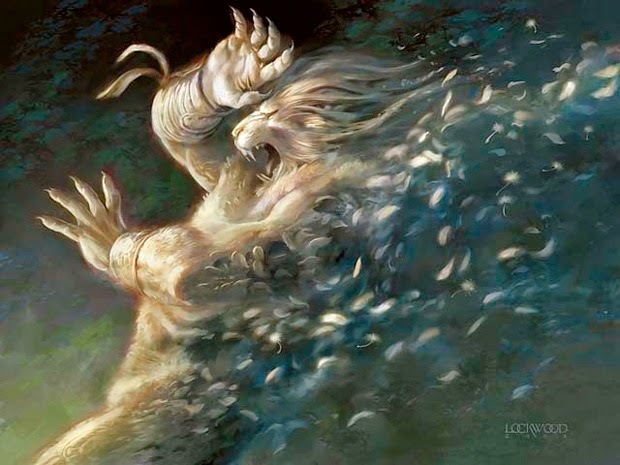 In addition, Lorwyn supports a menagerie of animal and supernatural life, including wisents, springjacks, cervins, a semisentient race of mimics known as changelings, and the majestic greater elementals. 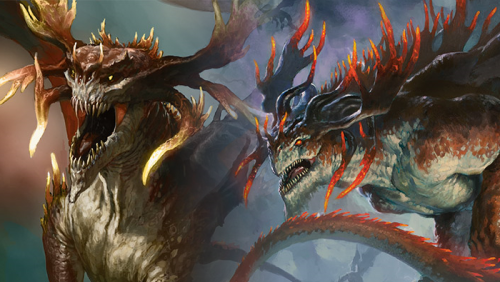 All of them thrive in Lorwyn’s temperate environment and unending growing season, preserving the plane’s character as an unspoiled natural wilderness. 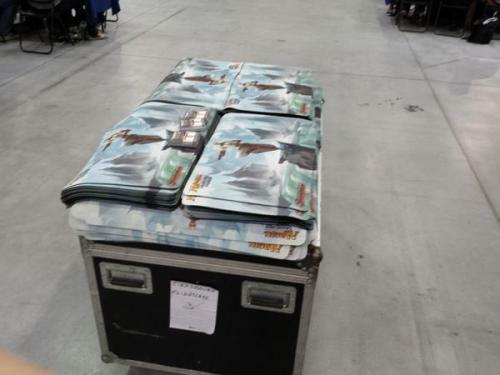 I guess this is what the entire Theros set looks like in foil. 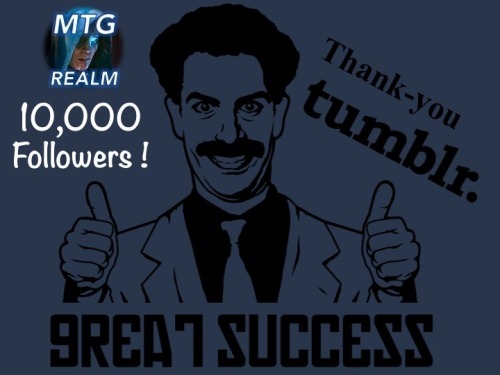 MTG Realm - Great Success ! Turn 4 Graceblade Artisan wearing a Jeskai Runemark making it a 6/7 flier. Gods Willing in hand and an Aqueous Form. Dude went into the Avatar State real quick and now OP as frack. CopySix (yours truly) playing a Green-White Enchantress list with Krond the Dawn-Clad as the Commander. 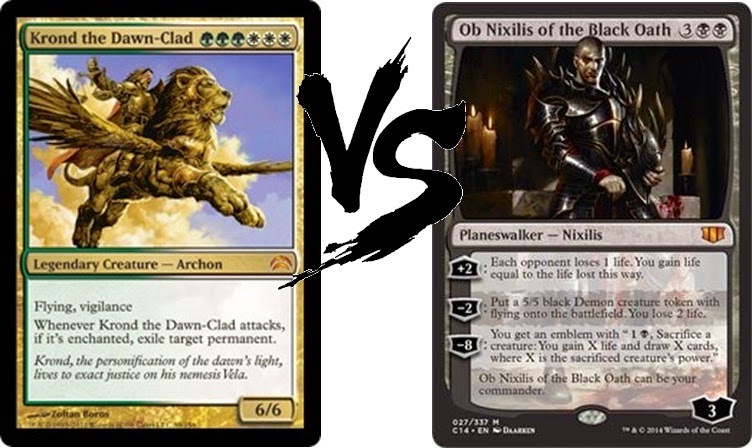 Ob Nixilis of the Black Oath, 3BB+2: Each opponent loses 1 life. You gain life equal to the life lost this way.−2: Put a 5/5 black Demon creature token with flying onto the battlefield. You lose 2 life.−8: You get an emblem with "1Black, Sacrifice a creature: You gain X life and draw X cards, where X is the sacrificed creature's power. "Ob Nixilis of the Black Oath can be your commander. • CopySix's General - Krond, from the Planechase 2012 Edition. • able to block most threats with Bassara Tower Archer (hexproof, reach) which is enchanted by Pentarch Ward granting protection against Black (rather obviously. • Sacred Wolf (hexproof) as well as Aura Gnarlid (+1/+1 for each Aura on the battlefield, creatures with power less than Aura Gnarlid's power can't block it). • Boonweaver Gian tutor for Ancestral Mask, cast and immediately nerf'd with a Go for the Throat. • Also in play Vampire Nocturnus (if top card library is black, vamps you control get +2/+1 and flying). Filling out the ranks is Vampire Nighthawk (2/1 flying / lifelink / deathtouch), and Deathgreeter (gaining 1 life whenever a creature dies). CopySix casts Auramancer returning Ancestral Mask, attaches to Aura Gnarlid, which also has Armadillo Cloak on it as well. Eldrazi Conscription TOP DECK (aura +10/+10, 'annihilator 2'), and cast on Bassara Tower Archer. Aura Gnarlid is a 19/19 ('un-blockable') with Trample and Bassara Tower Archer is a 12/11 'pro-black', attacking for leathal. • Ghostly Prison (opponent must pay 2 for each attacking creature they control) down early preventing early life loss. • Bramble Elemental (generating a 1/1 Saproling token any time an aura is attached to it) generates a number of tokens which get eaten every upkeep by RStomp's Sheoldred, Whispering One. • Nomad Mythmaker (W, Tap retuning aura in graveyard to play), and a Monstrous Fleecemane Lion also on board. • Bassara Tower Archer is wearing the Angelic Destiny aura (+4/+4 flying, first strike, Angel creature type) and Krond just gets cast - things are looking up. • A number of early chump blockers eat the 'yard', with Gravecrawler coming back occasionally. • Vampire Nocturnus and Crowd of Cinders (P/T = # black permanents you control) fill out the field. 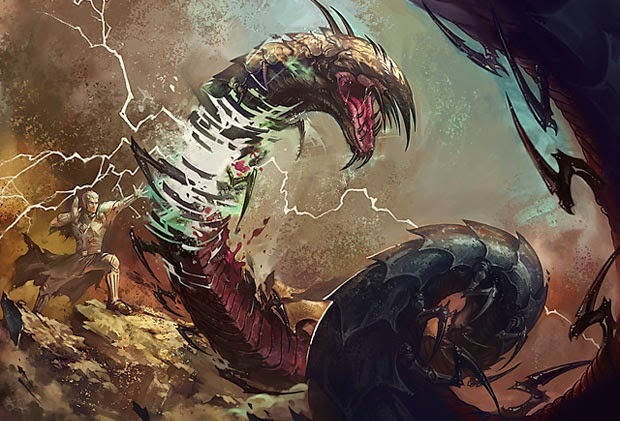 • Wurmcoil Engine (6/6 artifact creature which produces two 3/3 wurms - one life link, one deathtouch) is on the field along with Sheoldred. RStomp casts In Garruk's Wake (one-side board wiper) and is able to get the Sanguine Bond / Exquisite Blood combo out. Gray Merchant of Asphodel gets cast for lethal damage which doesn't even matter due to the wining combo - over the top OP. Here at MTG Realm, we have yet another product review again from BCW Supplies - this one for the card sleeves. 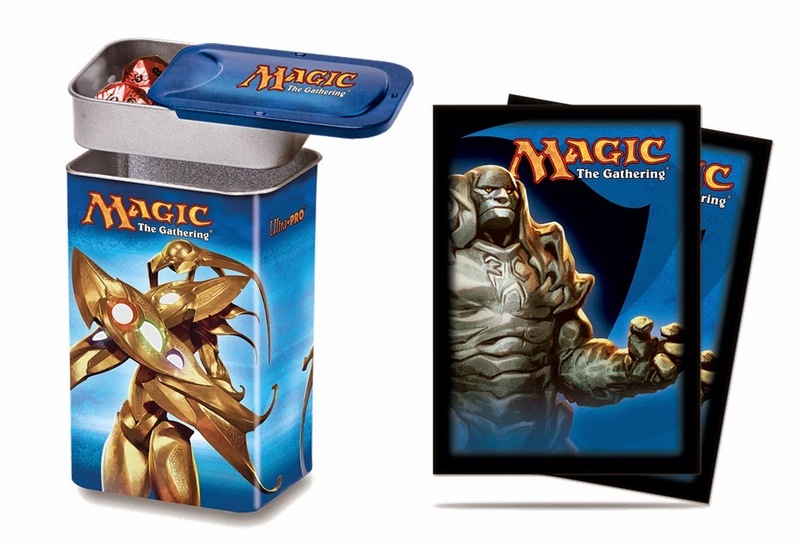 More specifically, the standard gaming sleeves as well as their Inner Sleeves. We're certain that Magic: the Gathering fans, or for that matter, any card gamer has experienced the pain and frustration of poor quality sleeves. Sometimes new and right outta the package the inexpensive ones split, even with a very careful shuffle. Another somewhat common sleeve issue which we've personally experienced some years ago is the purchase of several same-brand card sleeve packs from the same manufacturer where not only the colour was ever so slightly off, the solid colour sleeve back on the one sleeve pack was considerably thinner so that one could see the back of the MTG card. Specifically, these were the BCW Supplies Double Matte Black Deck Guards, 66 x 91 mm sleeves which are designed to fit the standard 2½" x 3½" game card. We have really no concerns at all with these sleeves and the only note was that although these are labeled as clear non-glare, there was indeed a slight glare. We would temper that statement with 'we've seen so much worse' and consider the amount of perceived glare (at the local store as well as our play group at home) to be barely worth to be mentioned. To be very honest an clear, in the 8 or so years we've been playing Magic: the Gathering, we have not once used inner sleeves on any of our cards. In retrospect, we will freely admit that there have been a handful of occasions in the past where we really should have. Case in point - one rather late evening with the playgroup at home, one of the members unknowingly had a very small volume of cold beverage condensate wick into a foil Noble Hierarch and then mangle-shuffled. Sobriety was not present. This lovely card (just under a $100) now had a nasty corner (sorry no image taken of ths). We should think that were the card double-sleeved, such a disaster would have been averted. 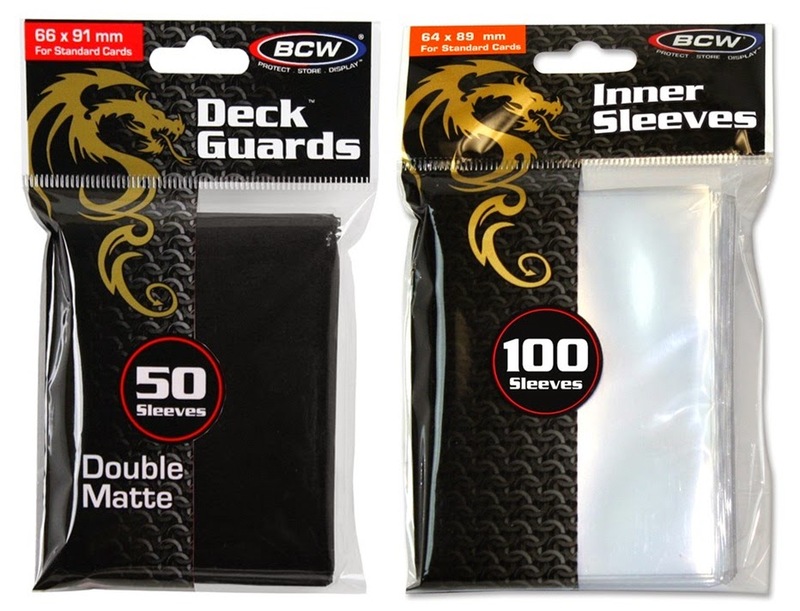 Anywhoos, here's the low-down on the BCW Inner Sleeves - These are a perfect skin-tight fit of 64 x 89 milimeters and when employed in an opposing fashion (inner / outer sleeves at opposite), the arrangement provides a near impenetrable barrier to safeguard your cardboard asset. We personally found it a bit time-consuming to get the perfect fit inner sleeve on but will admit that the time spent is well spent indeed to keep your precious investment looking tip-top. 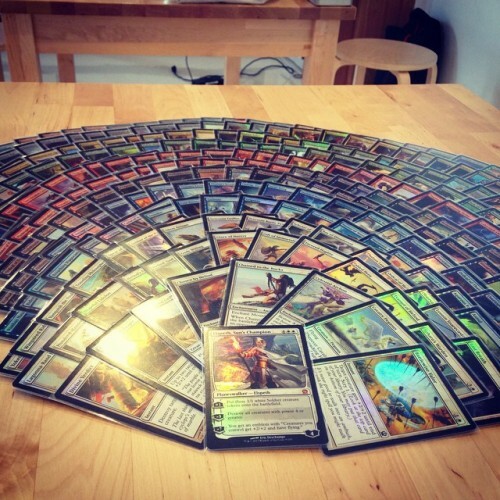 Today's article is short 'n sweet with load of Magic: the Gathering eye candy. Specifically, a very lovely bunch of 'merged' images created by Andrew Weisel who runs the Tumblr blog 'Sarpadian Empires Vol. VIII', which, if you have not yet dropped by, we encourage you to.